The extraordinary garden path began about 20 years ago by the front door of a low-slung, white brick home in the Lakewood neighborhood of Dallas. A little girl stood by the door. One of her parents snapped a photograph, and just then, Logan Garrett began trying to eat a leaf. From that moment on, her father, Howard Garrett, became an organic gardener. Now, two decades, one radio show, several columns and 11 books later, Garrett is the best-known organic gardener in the Fort Worth/Dallas area. His daughter, undamaged by leaf nibbles, is grown, and his yard has flourished into a small piece of heaven. Garrett has created a woodland where the graceful branching structure of native trees lends dappled shade to his St. Augustine grass front yard. An understory of adapted nandina and Japanese maples is lighted by dancing shards of sunshine. The sunnier, parklike back yard is gently divided into garden "rooms" defined by steps, undulating beds and a path of Oklahoma flagstone quarried west of Fort Worth. Follow this path and you’ll learn about Garrett’s gardening tips, the most important of which is how great home gardens are always a labor of love. Texas Tech University graduate set about doing what he loves most in the garden: planting trees. In the front yard went the native trees — Mexican plum, Mexican buckeye, Eve’s necklace and more. The trees are not plunked into the middle of the lawn but instead grow in vast beds, not one of which has straight edges. He put in a fast-growing bur oak not more than 8 feet from his front door, although most gardeners will tell you that 20 to 30 feet from the house is a better distance, to avoid trouble with branches and root. One of the remarkable things about Garrett’s garden is that he does not always garden by the book, even one he wrote himself. Yes, he amends his soil with organic matter from compost to cornmeal to molasses. He sprays with his trademarked Garrett Juice, an organic base from which liquid fertilizers or insect sprays can be made. But, like the rest of us, Garrett takes a shortcut now and then. The drive, lined with inland sea oats, leads past the back door and a bed featuring flourishing azaleas. Going against his advice in Texas Gardening the Natural Way: The Complete Handbook (University of Texas Press, $35), Garrett did not raise the bed to improve drainage, nor did he plant in his own recipe of cedar chips, greensand and compost. "I just put it in the ground with compost," he says, a tinge of "I-don’t-care" in his voice. He’s just not all that into things that flower. The blooms are incidental to his love of foliage. "I’m not into a whole lot of color. It’s too much of a hassle. I like to spend time with the trees," he says, standing in the shade of abundant evidence. Of course, the Dirt Doctor, as he is known, has amended so much organic matter into his clay and limestone soils that even an unconventional azalea planting is bound to thrive. From there, through the gate, the flagstone path begins to wend its way to various garden rooms. Turn to the right, and the path leads you up a few steps to the swimming pool, where there are signs that though Garrett is a godlike gardener with a healthy landscape, he also is a mere mortal. He owns up to having planted a Chinese pistache tree without having adequately loosened the wound-up root ball when he took it from its pot. The proof of this emerged when the poolside tree blew over. The exposed roots told the tale. They had wrapped around one another as if still in the pot. When the tree fell, it almost hit his prized potted 30-year-old Japanese maple, one of about 10 Japanese maples on his property. Then there is the matter of the deciduous pond cypress planted near the pool, where it litters the water with dropped leaves. He loves the unusual character of the tree. Its feathery, graceful foliage appeals to him. He’s just like the rest of us: Such enthusiasm can lead to regrettable choices. "That was the stupidest place to have planted that tree," he says. The flagstone around the pool leads to a hot tub tucked back by the side of the house. Then the path drops back into the garden, where it leads past the small pond that languishes without a pump or even many fish. It seems Garrett’s dogs enjoy the pond a little too much. "Every time I put in a pump, the dogs tear it out," he says. His small black dog, Shadow, indiscriminately eats whatever kind of fish Garrett uses. Koi is as good as tilapia to the little pound-rescue dog. The grass in the back has taken a beating by Shadow as well as by Garrett’s mixed-breed, Hannah, and Bernese mountain dog, Tully. "All three dogs help me garden," Garrett says. The dogs dig. They remove turf. In one dog-trodden area, Garrett laid decomposed (pulverized) granite that packs down so tightly that it serves as a paved area. Also as a dog deterrent, he planted thorny Chinese holly around the rest of the bare patches. Within that barrier, he had a contractor plant white impatiens, red geraniums and other annuals. Eventually, he will fill the area with perennials so that it resembles nearby beds of Virginia creeper vine used as a ground cover and interplanted with ginger and inland sea oats. Other beds abound with another Garrett favorite, perennials with giant leaves. He’s fond of hoja santa, elephant ears and rice paper plants, all of which have leaves a foot or more across. I love foliage," he says. He gently grasps each plant he stops to describe, shaking it lightly as if in a gentlemanly handshake. Next to the pond is a gazebo and beyond that, along the back fence, a compost pile that is the resting spot for a pile of leaves that sometimes is stacked up to 7 feet high. The flagstone path leads past an herb garden, the centerpiece of which is a 25-foot bay laurel tree that Garrett swears has never suffered freeze damage. Bays in North Texas tend to reach just 8 feet tall. Garrett says it’s his organic soil-building program that keeps the tree healthy enough to withstand winters. His only vegetable is asparagus, a perennial. Among his few fruit trees are the trusty fig and the jujube, with fruit that tastes of dried apples. The path then curves past a little-used greenhouse that now serves mostly as a "fancy dog kennel," Garrett says. Two armadillos wandered into the kennel recently and did not survive. Hannah, Garrett suspects, is part coyote. As the path completes its circle, it ventures past Garrett’s experimental flowering dogwood tree. The graceful, white-blooming tree normally isn’t happy outside East Texas. But Garrett saw a stand growing wild in Cedar Hill, and from those he has raised a dogwood he hopes will thrive in North Central Texas. Adapted dogwoods are not available commercially. "Not yet, anyway," Garrett says. He experiments a lot. "It’s the only way you learn," he says. His yard is not an installed landscape that can be done once and then ignored. He has taken out a dozen trees, some of which he planted himself. 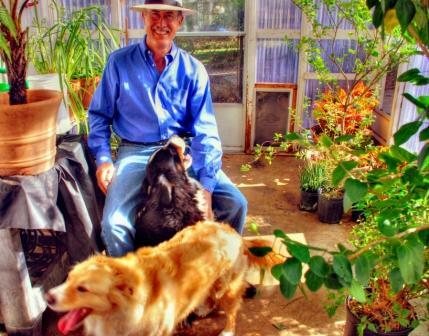 He has adjusted it as life — and dogs — change the way he wants to use his land. And, because of his career in gardening advice, he must always experiment by growing different plants. Overlooking this landscape is a 40-foot-tall ginkgo tree that he planted in 1985, the year his daughter, Logan, was born. It serves as a reminder of the love that caused him to switch to organics, which in turn led to a career that has bloomed and flourished. He publishes a monthly online magazine, The Dirt Doctor’s Dirt, and has a Web site, www.dirtdoctor.com, where gardeners can learn about organic techniques. Writes a weekly column for the Dallas Morning News.